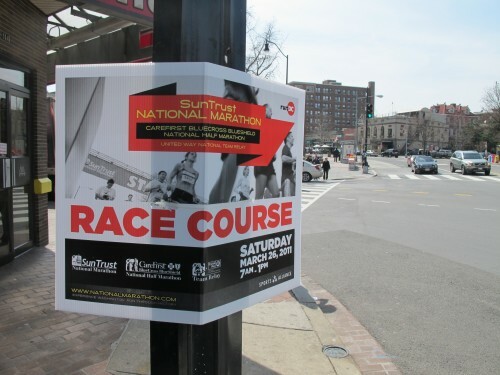 PoPville » National Marathon Street Closures on Sat. – Good Luck to all the Runners! National Marathon Street Closures on Sat. – Good Luck to all the Runners! The Metropolitan Police Department (MPD) has provided the following information about the SunTrust National Marathon and Half Marathon, which are scheduled to be held on Saturday, March 26, 2011. In order to facilitate these events there will be no vehicular traffic allowed along the routes of the races. The races are scheduled to begin at approximately 7:00 am; however some street closures will begin as early as 6:00 am. All streets affected by these events are expected to be reopened at approximately 1:30 pm, depending on prevailing conditions. Motorists should expect delays during the races. Citizens who have issues to be resolved or questions regarding traffic access during the races should call (202) 727-9099 or go to www.nationalmarathon.com.